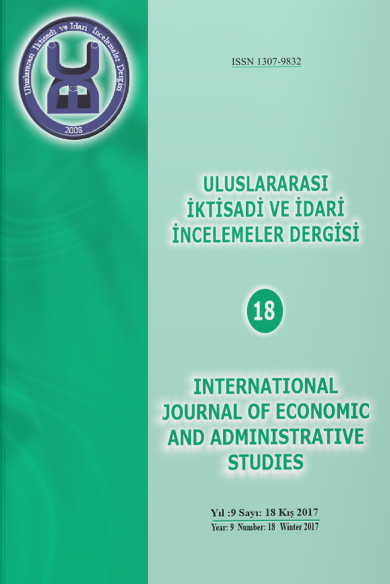 International Journal of Economics and Administrative Studies (IJEAS) is published in English and Turkish languages four times a year, every January, April, July and October since 2008. Manuscripts, which have been published previously, accepted for publication, or currently being considered for publication elsewhere will not be considered for publication. The author(s) are solely responsible for the ideas and opinions expressed in the articles. IJEAS is published printed- electronically and managed double-blinded journal from the submission of manuscripts to the publication. You need to specify the field of your article (Economics, Accounting, Econometrics, Finance, etc.) in the editorial notes section. Please check the writing style before submitting your article. Articles that do not comply with the writing style will be rejected. To view the writing style, please click here. The articles must be submitted online via the journal system. The article process is carried out through the online journal system, which you will enter with all your username and password. Since the texts will be evaluated according to the double-blind peer review system, author and institutional information should not be included. Author and institution information will be requested from you if your article is accepted. The Editor checks the paper’s composition and arrangement against the journal’s Author Guidelines to make sure it includes the required sections and stylizations. The quality of the paper is not assessed at this point. Articles that do not comply with the writing rules are not included in the referee process. This case will be reported to the author(s) within two weeks. The articles are taken into plagiarism detection with the iThenticate program before review process. The authors are committed to submit only original studies, and these studies should not have been published or currently under consideration for publication elsewhere. IJEAS aims to have a first decision regarding the likely suitability of an article between 14 days. Submitted articles are first validated by the Editors, which check for writing style, plagiarism and basic scientific compliance. The Editors may choose to reject the article that do not fit within the scope of the IJEAS or are not comply with the writing rules or contain plagiarism. A field editor is assigned to the texts that pass through the preliminary assessment. The field editor appoints two referees who are experts in the field. Evaluation process of the reviewers is between 3 and 4 months on average. If one of the reviewers has a positive opinion and the other has a negative opinion, the article will be sent a third reviewer. In order for the article to be published, the two referees must provide positive feedback. When the article is accepted, corresponding author is informed. After the two reviewer have accepted the article, final acceptance process is designed to complete within 16-20 weeks. At the end of the process, the article is published online. The DOI number is given to the articles considered suitable for publication in the journal. There are no publication and submission fees for IJEAS. All articles published in IJEAS are open-access articles, published and distributed under the terms of the Creative Commons Attribution 4.0 International License, which permits reproduction, distribution, commercial use, provided the original work is properly cited and authors and publisher are properly identified. Click here for the publication right transfer form.